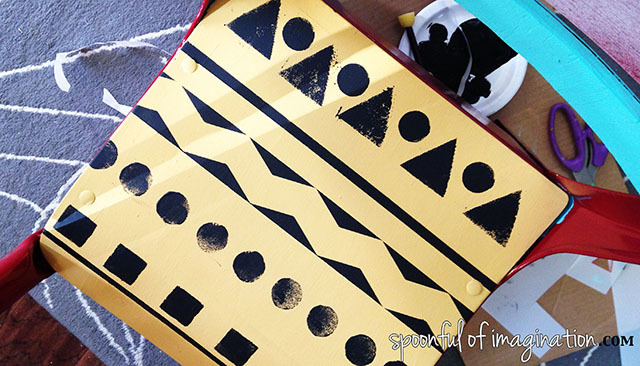 Have you fallen in love with tribal patterns? I know I have. I have tribal leggins and everything. There is something so basic, simple, yet fun about the classic shapes creating a pattern. I found this little old school desk at a thrift store for $10.00. I couldn’t pass it up. I brought it home and started working on it a little at a time. 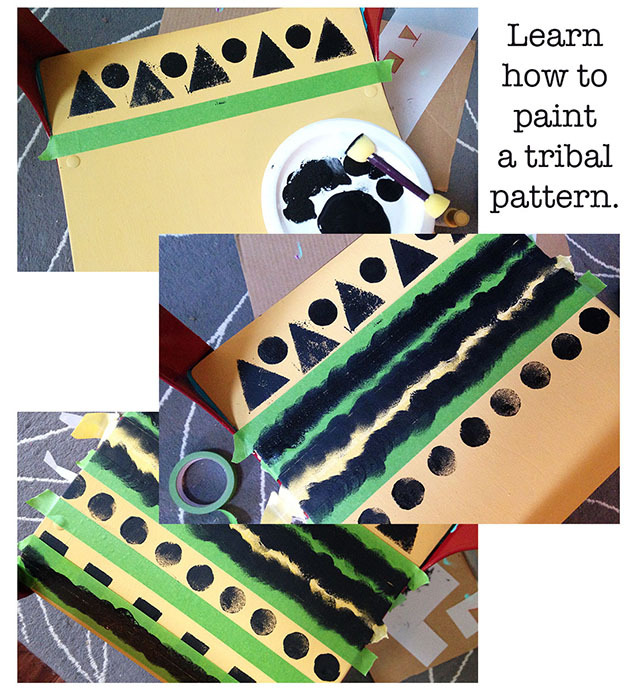 One thing led to another and I was creating my own tribal pattern! It was so fun. I want to show you the steps, so you can take this technique and put it to use on something of your own. 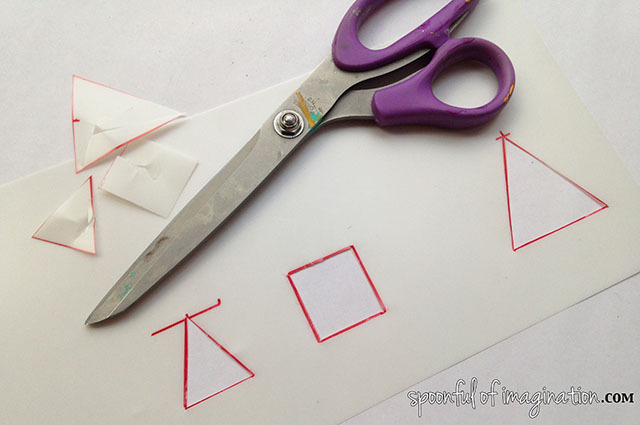 The first thing to do is to create a stencil with some basic shapes, if you don’t already have one. I didn’t need a circle, since I used this type of paint brush . I used a ruler, sharpie, and some stencil paper to measure two sizes of triangles and a square. I then cut the stencils out, and they were ready to use! I used Frog tape as my paint tape to create some thick stripes. 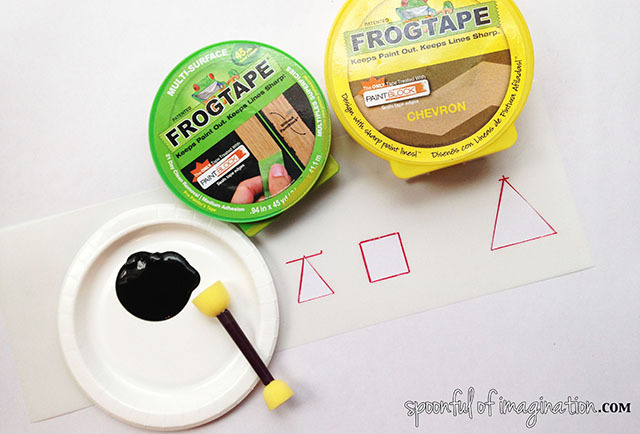 Note: FrogTape has some really fun shaped patterned tape. 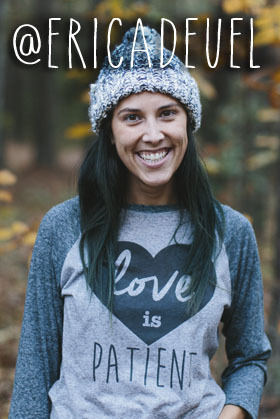 I received this chevron print in my Haven swag and have loved using it! Once, I had my stencil, foam brush, tape, and acrylic paint out, I was ready to start creating! This was the fun part. I felt like a little kid in art class again, just playing around with what shapes and spaces looked good together. There is no right or wrong way to order them. You just need to start somewhere. I started with stenciling some big triangles. I then realized there was a lot of space in between them, so I went back and dabbed in a circle with my sponge brush. I literally created as I went. Two things to keep in mind: 1) its ok if the stencil and sponge marks are not solidly painted. It probably will look better if it has a rough, worn look. 2) remember to paint on either side of the tape if you want the tape to create a solid stripe. That way when you pull up the tape, you will see a nice solid stripe. Once I pulled up my tape, I had a lot of empty spaces. So, I actually put some tape down on parts that were already dry, to allow me to create some more stripes closer together. It worked great. Since I was not wanting a thick paint job, everything dried fast too. 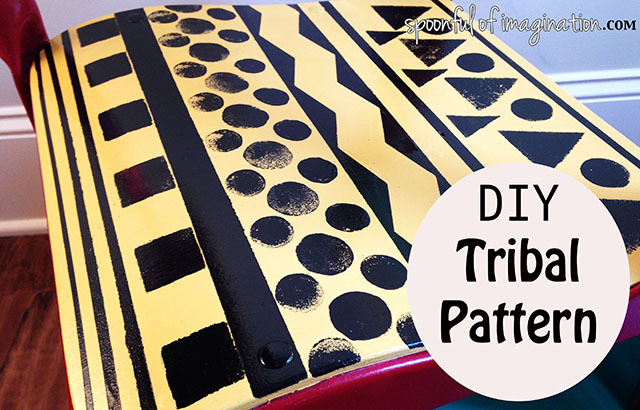 After I had my tribal pattern complete, I used Rust-Oleum clear gloss spray paint over it to protect it and make it look finished. I love the way it came out! I think you could use this idea on any piece of furniture, greeting card, sweatshirt, etc. So many ideas! 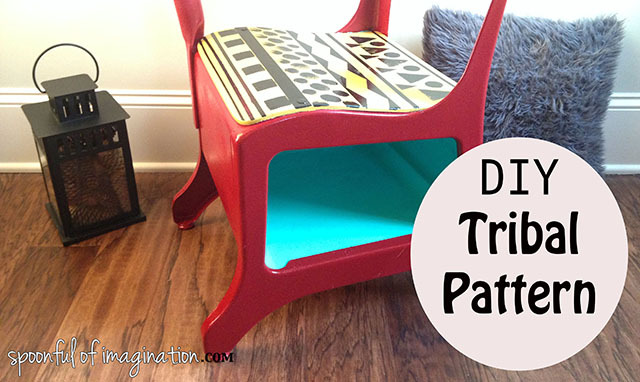 Use your imagination and place a tribal pattern somewhere! Thanks so much for checking in! I will be back on Wednesday to show you the rest of this school desk. If you haven’t had a chance yet, enter to win a Spoonful Tribe craft kit. The winner will be announced in the post on Wednesday. A genius you are! Love it! Pinning!